Full disclosure: I distributed a printout of a Wall Street Journal piece Hugh Pope had written at my Apollo Theater concert 2 weeks after 9/11. Unfortunately the juggernaut had already begun its relentless and disastrous crawl, and no amount of “fact-based reasoning” (as the Bush administration disdainfully called it) was going to derail this monster. This was not a screed from some lefty blog or the blame America fringe, this was a heartfelt cry for reason, empathy and understanding from the headquarters of capitalism. 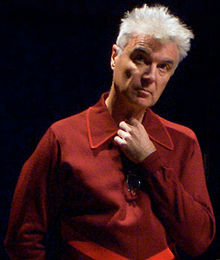 Back in those confused days of September 2001, I had just returned from an al-Qaeda chasing trip to Dubai, Ras al-Khaimah and Tehran when I saw David Byrne’s message offering to give his concert-goers copies of the story I’d written with my colleague Peter Waldman. In that front-page Journal story on 21 September 2001, ‘Worlds Apart: Some Muslims Fear War on Terrorism Is Really a War on Them’, we tried to tell America the background to the disaster that had just hit them. Back then, for a precious few weeks, the shock of the attacks gave rise to a genuine questioning about what on earth was going on. Then the U.S. government went on the offensive, and the rest is history. this article has touched off more reader response than any other story I’ve ever had anything to do with. [The response] was overwhelmingly positive, and people kept saying ‘thank you.’ I think it shows just what a thirst there is for a new approach to reporting on Middle East affairs, and how tired, confused and possibly disatisfied people are with the mainstream narrative we usually stick to.